Way... way back when I first started this crazy MajorPandemic.com testing endeavor, one of my first reviews was the Burris Fast Fire II and loved it. At that time it was the only quality automatic brightness red dot on the market and it has continued to deliver flawless functioning in all lighting conditions even today on my Mega Arms ultralight build. The problem was that it did not come with a co-witness height riser and the sight needed to removed from its base to change the battery. The result was some pain to find just the right riser height and occasionally rezeroing with a battery replacement. Burris had its ears to the ground and listened to customer feedback. 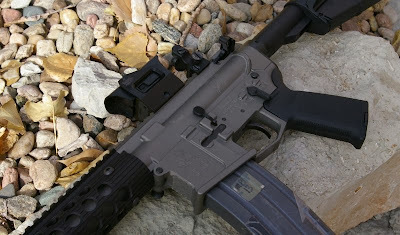 A large majority of customers were mounting the previous Fast Fire II to AR15 rifles and liked the extra armor “wings” the AR mount provided, but hated the battery replacement thing and also not having a rise included. Burris went one step further beyond curing this issues with some creative solutions that no other manufacturer has offered on a red dot projection sight. 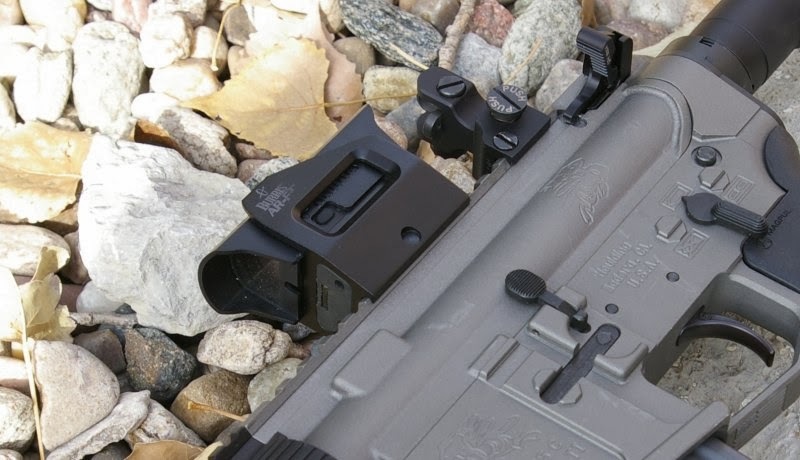 Burris updated the Fast Fire II with the new Fast Fire III 3 MOA version to now include all the things users were asking for plus a few surprises they did not know they needed. Burris fixed the bottom loading battery with a top loading unit, but kept a lower cavity under the sight to house a last ditch spare battery. Sure accessing it will require sight removal from the base however at least you have a spare carried on board. Burris also engineered the sight to key into the base, so even if you do remove it to access that spare, you will still return to zero. The new AR-F3 mounts right up to either Weaver or Picatinny mounts. 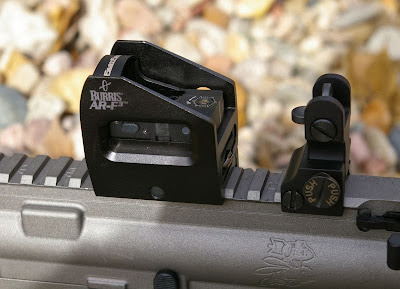 Burris also integrated an AR15 specific co-witness height mount with the armored protection wings everyone liked, so you not only get a perfect height rise you have built in protection for the sight. 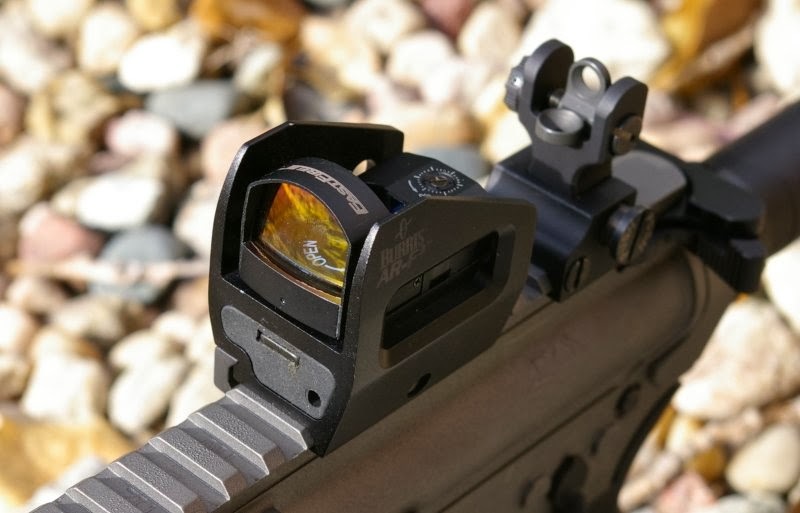 Burris even went one step further and provides a slip-on UV/Polarized sight cover which offers further sight protection along with a sight hood that prevents glare during very bright sunlight situations - many of the military refer to this now as a sand shield. 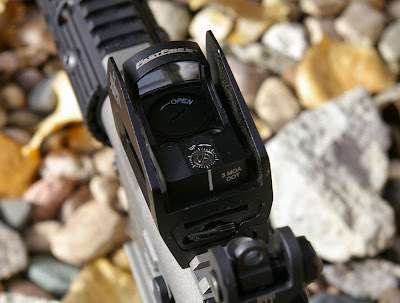 Along with the 3-MOA auto brightness red dot, Burris added three manual levels on off-mode to assure you can tune the right auto-brightness range and of course actually turn the power off when not in use. Other extras are on-board stored wrench to secure the sight on the rifle and a combo Torq wrench/screwdriver tool to remove the Fast Fire III sight and adjust the zero. You will never find yourself in need of the right tool to tune your AR-F3. Carried over are the rugged steel body construction, 100% waterproof case, and 1-year warranty. I mounted the Burris Fast Fire II AR-F3 sight to my Houlding Precision Custom AR15 and set about zeroing. This is where another enhancement surfaced - zeroing adjustment now also have detents. The old Fast Fire II was painful to zero… really painful, like you wanted to throw the gun down range painful. Thankfully the AR-F3’s zeroing adjustments now gleefully clicks into each position which made zeroing as easy as zeroing any scope. Once zero’ed at 25-meters and verifying zero at 100-yards, I was able bang away easily on the 300-yard 12” steel gong. Over in a secluded tactical training bay I was able to set up left, right, and forward targets and give the Burris AR-F3 a workout at short distances. The biggest advantage I saw was that the sight offered far more peripheral vision and field of view than typical tube red-dot sights.